Raumfahrt - Will We Ever Stop Using Rockets to Get to Space? SpaceX has publicly revealed the sleek, minimalist design of the access arm that NASA astronauts will soon use to board Crew Dragon spacecraft, bringing to an end more than half a decade of U.S. dependency upon non-native rockets and space agencies to transport crew to the International Space Station. After several months of concerted effort in a tent located on Pad 39A property, SpaceX engineers, welders, and technicians have nearly completed the most critical portion of the launch facility modifications and upgrades necessary to return the pad’s human spaceflight capabilities. Known as a Crew Access Arm (CAA), SpaceX will likely complete installation of the Arm by the end of August, wrapping up what is by far the most visible step yet towards returning astronauts to the ISS on American rockets and spacecraft. 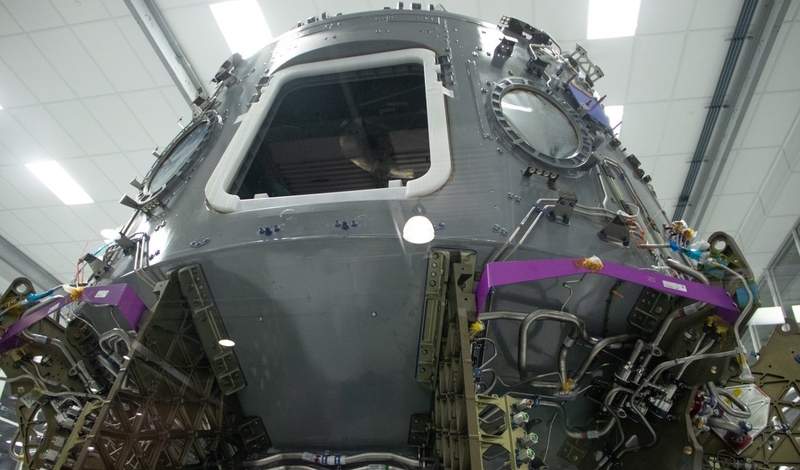 SpaceX’s first flightworthy Crew Dragon spacecraft are currently in various late stages of production, assembly, and integration in pursuit of an uncrewed orbital debut no earlier than (NET) November 2018 and its first crewed demonstration flight as early as April 2019. 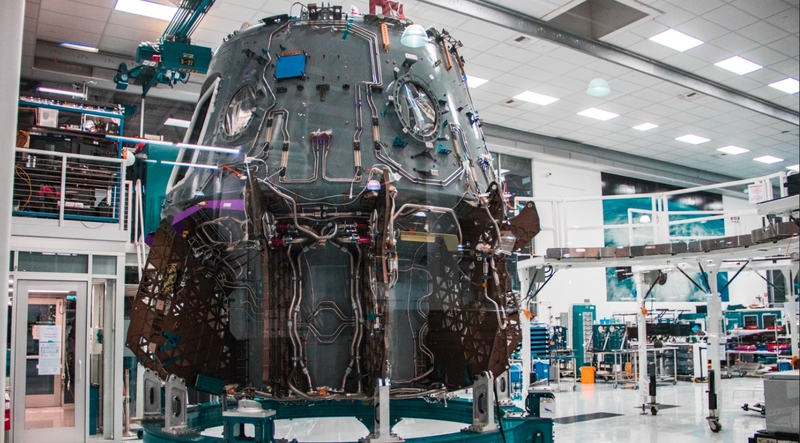 The first Demonstration Mission (DM-1) Crew Dragon capsule is already at SpaceX’s Florida processing facility, while its trunk/service module and Falcon 9 Block 5 rocket could ship to Florida as early as late August or early September. 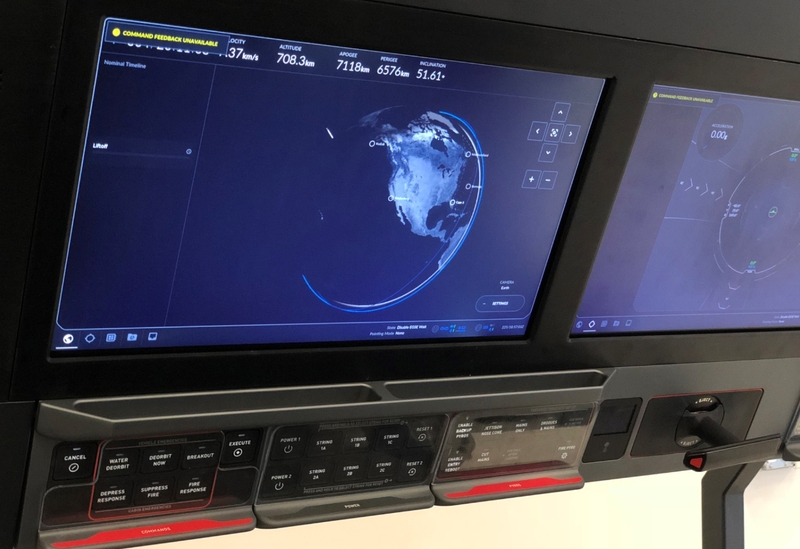 Boeing has already installed their own Starliner spacecraft Crew Access Arm at United Launch Alliance’s own LC-41 launch facility, although the design is definitely far more traditional than SpaceX’s comparatively wild departure from previous CAAs. Prior to SpaceX’s lease of Kennedy Space Center’s Launch Complex 39A (LC-39A), the pad operated for the full length of NASA’s Space Shuttle program, supporting dozens of launches of the fundamentally flawed – albeit iconic and awe-inspiring – vehicle. Still, Pad 39A is most famous for the critical role it played in NASA’s Apollo Program, where it supported nearly all Saturn V launches and thus all but one (Apollo 10) of the nine crewed mission to the Moon, Apollo 8, and Apollo 11 through 17. SpaceX and CEO Elon Musk are cognizant of this incredibly rich history, and it’s probable that humans will once again return to the Moon (at least its gravitational sphere of influence) from Pad 39A, but this time atop a SpaceX rocket and spaceship. A sister facility known as LC-39B, built to ensure two operational pads for the Space Shuttle, is also slowly tracking towards the debut of a different rocket targeting human exploration around the Moon, NASA’s Space Launch System (SLS). SpaceX President Gwynne Shotwell recently reaffirmed that a 2017 contract (money in hand) to send two private individuals around the Moon is still alive and well, although Musk has also noted that that lunar tourism mission will likely be flown with BFR and BFS, pushing it into the early 2020s at the earliest. While several years out and taking a definite back seat to Crew Dragon’s safe and reliable debut and operation in low Earth orbit, it’s clear that a separate human spaceflight race is simmering in the background, pitting public efforts against private efforts in a bid to once again send humans to the Moon. Just two weeks after the announcement of the NASA astronauts who will fly the company’s DM-2 and Crew-1 flights, SpaceX has provided more information and access to the Crew Dragon and now stands ready to install the Crew Access Arm – through which astronauts will board Dragon – at LC-39A at the Kennedy Space Center. The two milestones, especially the latter, signal a return to human-rated status at the launch pad that previously propelled humanity to the Moon and handled 82 of the 135 Space Shuttle missions. 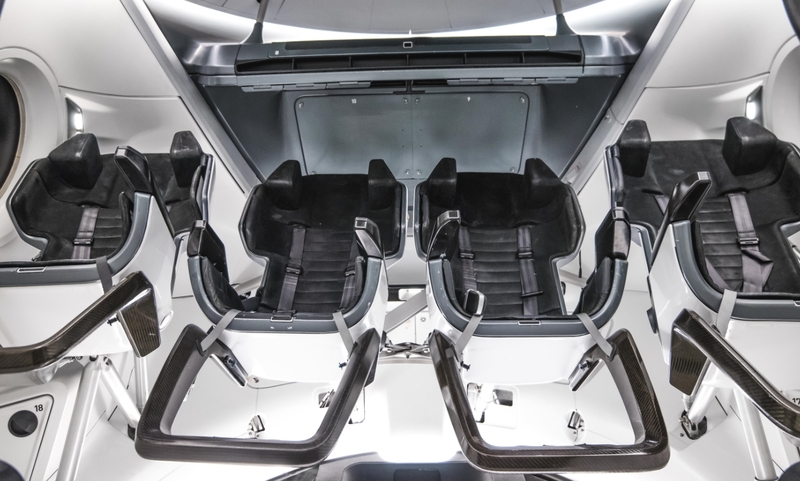 Over many years, the public has relied on carefully released images and information from SpaceX regarding Crew Dragon to gain a sense of the type of technological evolutions and interface designs SpaceX has planned for the crew transportation vehicle they hope will not just ferry astronauts to and from the International Space Station but also serve as a “launch pad” for future human-rated exploration vehicles. Following the official assignment of four NASA astronauts to the crew test flight (DM-2) and what astronauts are referring to as the “Crew-1” mission (known internally to NASA as Post-Certification Mission 1), SpaceX held a media day at its headquarters in Hawthorne, California, at which media were able to interact with astronauts as well as see first-hand a mock-up of the Crew Dragon that will begin flying later this year. During the event, attended by NASASpaceflight’s Jack Beyer, astronaut Doug Hurley, one of two crew members for the crew test flight, DM-2, related how his interaction with SpaceX and Dragon is changing now that he is officially assigned to a SpaceX flight. “Obviously [Bob and I] worked with both of the companies, and [that wasn’t] so much training that [we were] doing for the last three years, it [was] more like developmental, operational kind of work. So we were kind of looking to see what [worked] best, what [didn’t] work as far as crew module design, console design, spacesuit design, all the things that astronauts will touch on a mission,” noted Hurley. “So it was more of a developmental workload than a training workload. I think what we’ll see now – now that we’re focusing on one provider, one company, one vehicle – is [that we’ll] refine that down to what [mission-specific training] will actually be, maybe more specifically in terms of exactly the type of training that a crew of three would do. Fellow original Commercial Crew astronaut Bob Behnken elaborated on this, discussing the differences between Dragon and the Soyuz vehicle from Roscosmos – the only other currently operational vehicle capable of ferrying astronauts to and from the International Space Station. “Soyuz is some pretty old technology, if you will. It was designed in the 1950s and 60s, and so you are constrained with that shell with the Soyuz. Now they have upgraded it over the years. It is a very reliable vehicle,” noted Behnken. That innovation – as has been seen multiple times with SpaceX – has been highly successful while certainly challenging. “We are not going to fly until we are ready to fly these folks safely,” said SpaceX President and COO Gwynne Shotwell at the event this week. “First and foremost, safety is our primary concern. Next in line, we want to make sure that not only do we get these folks up and back safely, but that it is a reliable vehicle. We want to hit all the boxes, do everything we need to do to demonstrate that this vehicle is capable of taking astronauts up from U.S. soil as often as NASA will allow us to do so. 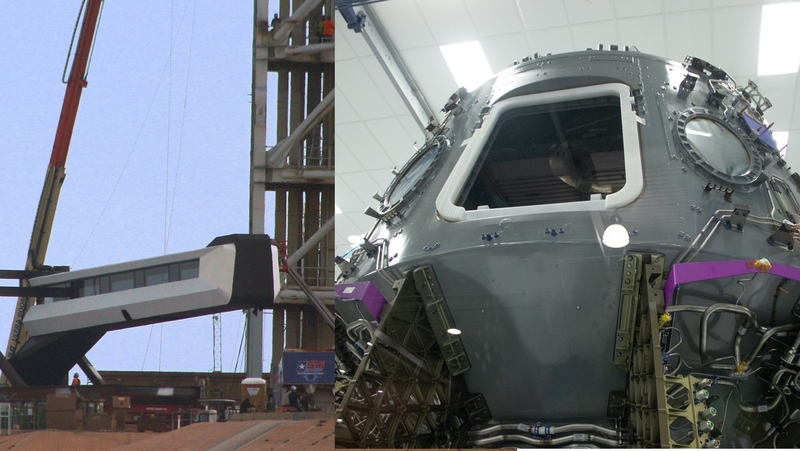 That extra attention to detail relates not just to NASA’s involvement with the development of Crew Dragon and the overall certification that the DM-1 and DM-2 flights will prove later this year and next, but also to the seriousness with which SpaceX is rightly treating the obligation it seeks to fulfill in allowing the United States to once again launch its astronauts as well as those from NASA’s international partner agencies. And that attention to detail and safety extends not just to the production and processing facilities at Hawthorne and Cape Canaveral but also to crew requirements at Launch Complex 39A at the Kennedy Space Center, from which astronauts will launch on Crew Dragon. Prior to the visual milestone this week of the Crew Access Arm, or CAA, being moved to the pad surface and the base of the Fixed Service Structure (launch tower), previous information from SpaceX and NASA indicated that the arm would be installed after the Dragon’s uncrewed demo flight. However, that schedule was based around a launch of the uncrewed Dragon flight, DM-1, in August 2018. With NASA announcing a 3-month slip to the DM-1 flight (largely due to ISS scheduling and crew reduction aboard the International Space Station in the coming months), SpaceX found itself with an unanticipated delay to the DM-1 flight – which in turn opened up a possibility that didn’t exist before to install the CAA in August. What’s now abundantly clear is how close SpaceX was to being able to install the arm on LC-39A prior to DM-1 when that flight was scheduled for this month. Which begs the question: If they were so close, why not install the arm ahead of DM-1 even if that mission had held to its August timeline? The answer lies in the complexity of installing such a piece of equipment on the Fixed Service Structure at LC-39A. 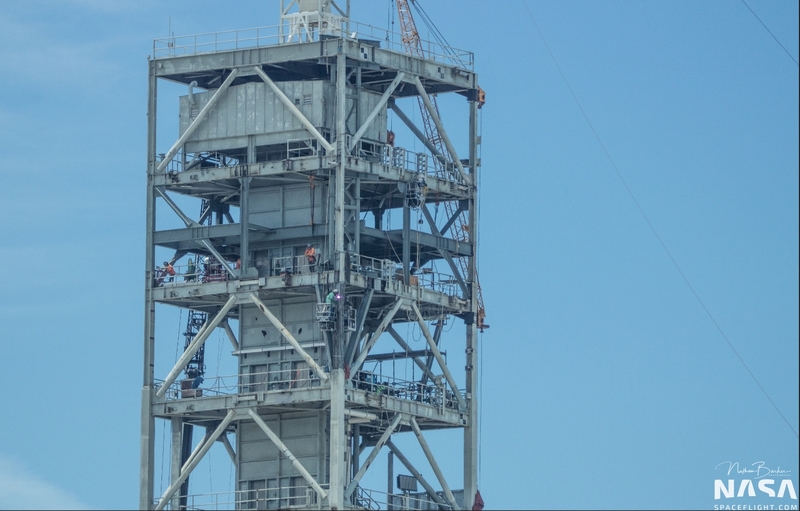 It’s not simply a matter of hoisting and bolting the arm on to the reinforce area of the launch tower, which in itself is a multi-week process. Other securing, rigging, testing, and connection operations are vital parts of the arm’s installation – all of which take a great deal of time to complete. When set against the potential schedule of launching DM-1 at the end of August – which includes static fire of the Falcon 9 rocket – it becomes clear that had SpaceX pushed forward with CAA installation ahead of DM-1, they would have had to delay the flight from August just to get the arm attached to the tower. But isn’t the arm necessary for Crew Dragon? Yes, it is. But not for the uncrewed DM-1 test flight. Since DM-1 won’t carry crew, the arm itself is not needed per the certification elements the DM-1 flight is scheduled to demonstrate. Thus, instead of risking a delay to the mission just to install the arm, SpaceX opted instead to hold off on CAA installation to allow the DM-1 mission to occur in August. But now that DM-1 is NET (No Earlier Than) November – a date Gwynne Shotwell is confident the company will meet, SpaceX is forging ahead with CAA installation because, quite simply, there is no reason to wait, at this point, to install the arm after DM-1. The work crews are present, the Fixed Service Structure additions and reinforcements are ready, and with no missions scheduled to fly off LC-39A until DM-1 in November, there is plenty of time to continue reconfiguring Pad-A over the next few months to return it to human-rated status – reconfigurations that will now aid SpaceX’s ability to test critical operations and processes that will be needed once people begin flying on Dragon and off 39A again next year. One major change at LC-39A that preceded installation of the CAA for Dragon has been the reconfiguration of the launch tower to accommodate the Falcon 9 and Falcon Heavy rockets. This most notably – and visually – involved the complete removal of the Rotating Service Structure (RSS), which has come down in pieces between SpaceX launches off the pad in 2017 and 2018. But the Fixed Service Structure has also largely been gutted and reconfigured – including removal of all Shuttle-era swingarms and External Tank access platforms – all of which were removed prior to the commencement of Falcon 9 flight operations from the pad in February 2017. Moreover, since Falcon Heavy’s debut in February of this year, SpaceX has been hard at work preparing LC-39A for Crew Access Arm installation, including the addition of a new level on the launch tower – with SpaceX employees and contractors adding a complete working and serviceable level at the 217-foot level above the pad’s surface. 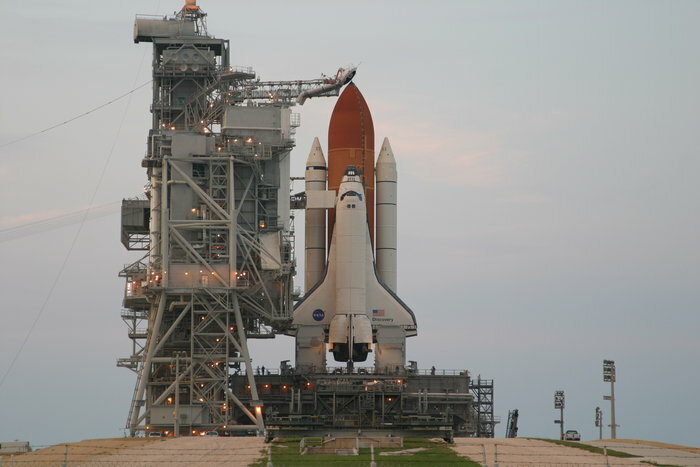 This is 70 feet higher than the Orbiter Access Arm (CAA equivalent during the Shuttle era) was mounted on the FSS and is located at the same height at which the Gaseous Oxygen Vent Arm (the arm that extended out to cover the top of the External Tank) was secured to the launch tower. So why the new level if the Gaseous Oxygen Vent Arm was attached at the same height? The simple answer is that the Gaseous Oxygen Vent Arm was accessed by already-present levels on the FSS directly above and below the arm with no same-height access because the arm was a last-minute, and late addition to the Shuttle program in 1979 and ‘80. This was not a problem in the Shuttle era as the vent arm did not require a direct escape route because the arm did not serve as a crew access route. But the CAA for Dragon will serve as the only egress route from the crew capsule to the slide wire escape system should the need to evacuate Dragon and the pad quickly arise during pre-launch operations. And that leads directly to the other major reconfiguration currently happening to LC-39A’s launch tower to once again make the pad crew-rated. 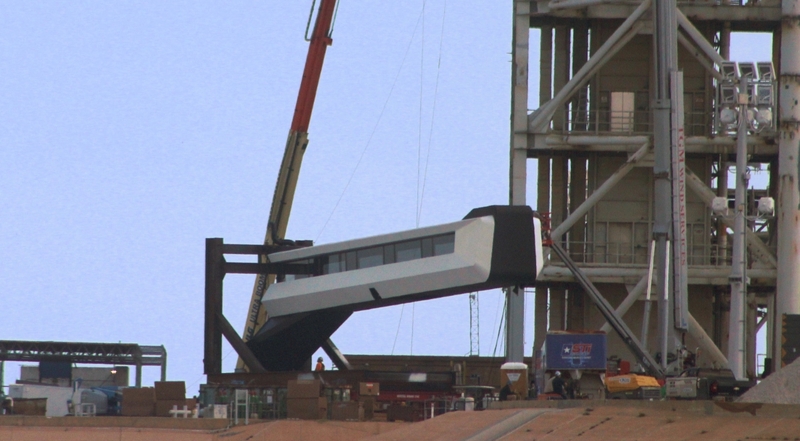 SpaceX is also in the process of raising the slide wire basket escape system from its Shuttle-era location up to the same 217-foot level that the new CAA will now occupy. The slide wire baskets allow for a quick egress from the pad in emergency situations for not just astronauts but any work crews on the tower as well. During launch operations, the slide wire baskets can take astronauts and pad crew safely to the ground several hundred feet from the pad and very close to an armored vehicle that they can then quickly ingress and use to drive to safety.